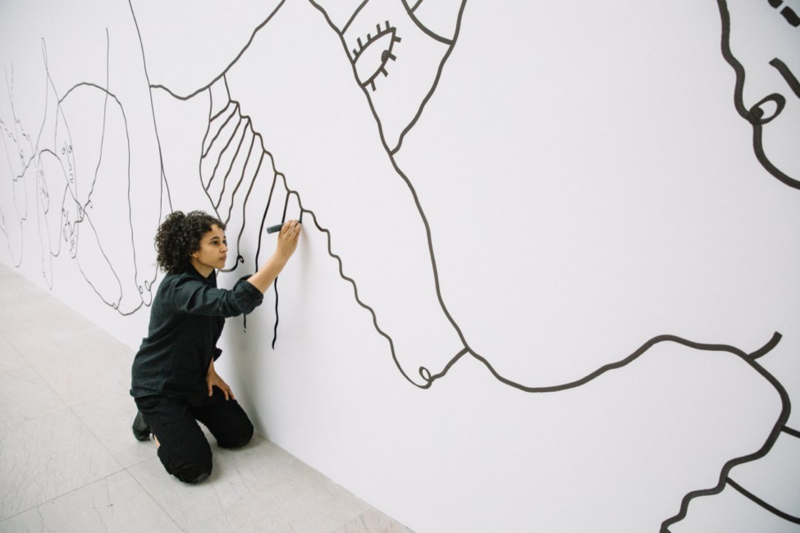 The Artist Who Gave Away His D..
Shantell Martin is a London-born, New York-based visual artist who has collaborated with notable creatives like Kendrick Lamar and global brands like Max Mara. Martin is known for her larger-than-life wall pieces, canvas work, and installations, consisting mostly of playful black-and-white illustrations filled with whimsical characters and messages. When we interviewed Martin, she disclosed details on her background, inspirations, current work, and advice for young creatives. Tell us a little bit about your background. What inspired you to become an artist? Was there an “aha!” moment that helped you realize this was what you wanted to do? I never really knew I could be an artist, even when I was successfully becoming one. Despite it being my primary passion for as long as I could remember, I didn’t believe it could turn into a full-time career. This is a common sentiment within the art community, as I’ve heard it from many of my peers. I realized there is a lot of struggle to overcome, and growing to be done, in order to see yourself in such a way. As for my work now, I make words, drawings, lines, and connections. In order to create my art, I need to be on a path where I can figure out who I am. Are there any specific events or aspects of your life that influence your work today? What are some of your ongoing passions that serve as constant inspirations? 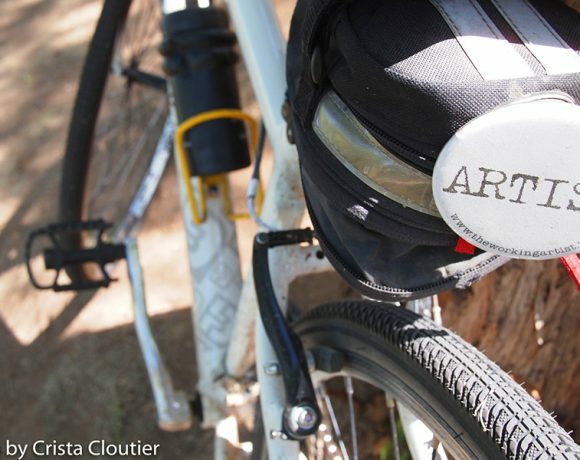 My life, environment, thoughts, questions, loved ones, experiences … they all affect my work. My art is very much in the present and relates to the me in that very moment. You could say my passions revolve around working to be a better version of myself, trying to have a more open heart, and striving to stay as organized and patient as possible. Your artwork consists mainly of black lines, symbols, and minimalistic messages. Where did this style of work stem from? 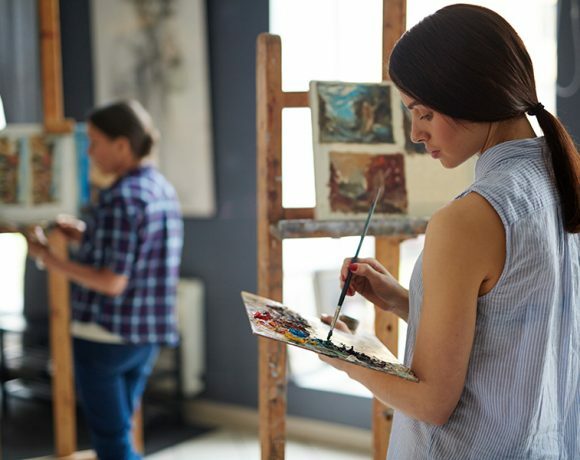 Have you explored other mediums, or even other areas of expressive art and creativity? During what now feels like a past life, I lived and worked in Japan as a Visual Jockey. I created real-time drawn club illustrations to performances by DJs, dancers, and musicians—this work was bold, colorful and digital. I’ve also been a scholar at MIT Media Lab for the past couple of years, where I’ve explored interactive mapmaking, printed circuited boards, and [examined] the analytics of my art. I’ve collaborated with many of my friends using code as our medium, and most recently, I’ve been exploring drawing with just music and my voice. I will always explore new mediums for my art—it’s how I continue to grow. You recently created a massive mural in Buffalo, New York. 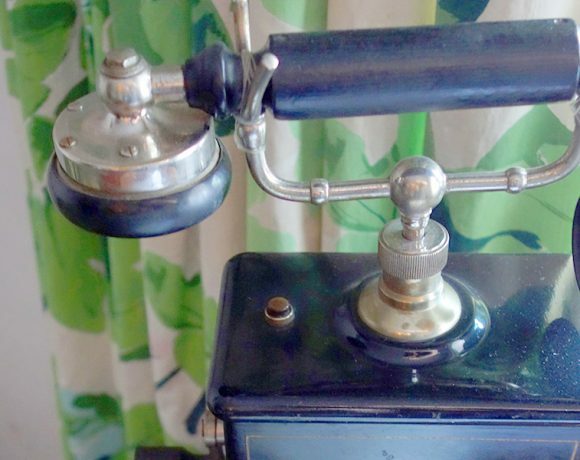 Tell us a bit about the story behind this piece. 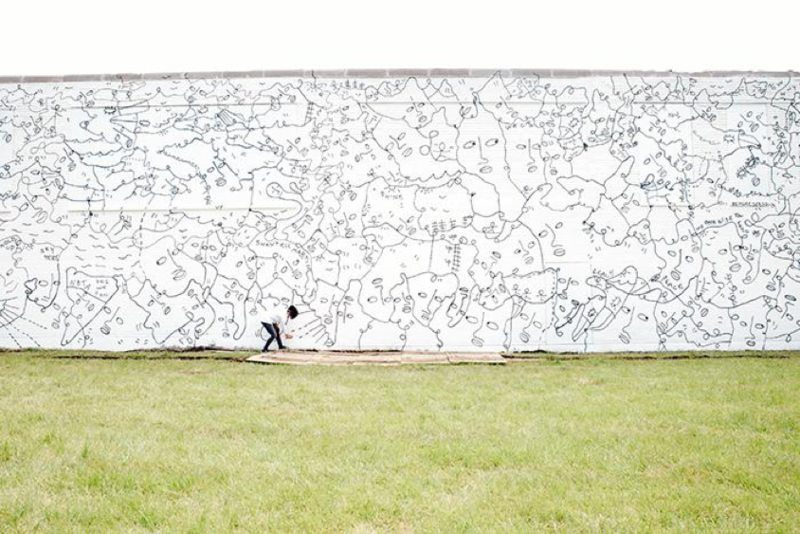 “Dance Everyday” is my largest drawing to date at just over 200 feet long, and is a permanent mural on East Delavan Avenue. I created this a couple of weeks ago in conjunction with my solo museum show at Albright Knox, but more so as a small step towards helping to re-energize the east side of Buffalo. It was such a profound experience for me. All day as I was drawing, members of this amazing community came by to say hello and speak to me about my art. I’m extremely thankful for how receptive and responsive they were to my work. I also heard there will be more renovations done to the surrounding space and an opening celebration for the mural. I hope to come back and be a part of it. What are some recent galleries you’ve exhibited at and shows you’ve put on? How was the experience, and feedback from the crowds? I haven’t been doing many gallery shows lately; my recent shows have been more music gigs. I’ve loved seeing the positive response from people. Each show is unique, as each one has kind of been spontaneous. I don’t really know how to play piano, but I simply play it with feeling because I’m inspired by the atmosphere of the venue and the crowd. Do you have any additional shows, projects, murals, or gallery openings coming up? I have a solo exhibition titled “Charge Your Self,” which will be going live at Chandran Gallery in San Francisco on July 13, and a public art piece I will be working on in downtown Denver. Otherwise, I’m winding down the year to allow myself to jump into really cataloguing my art works. Have you set any concrete goals for yourself and the future of your career? If so, what are they? Absolutely. I want to have a solid inventory of my artworks and start selling art in such a way that it creates connections and relationships instead of just being about making money. I want to focus on releasing my music and playing more gigs. I also want to expand my business and hire my first full-time employee. What advice would you give to those who are just starting out in their artistic careers? Don’t wait for anyone to create or give you opportunities. Go make your own by using what you have access to. 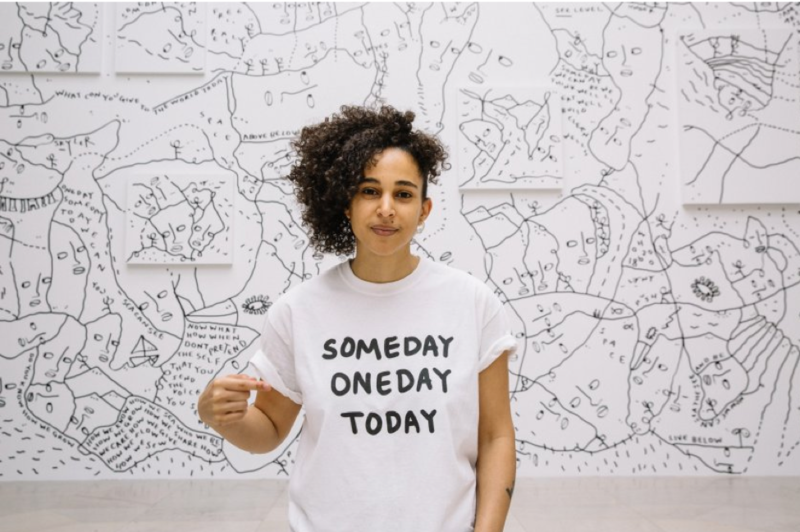 Learn more about Shantell Martin on her website.